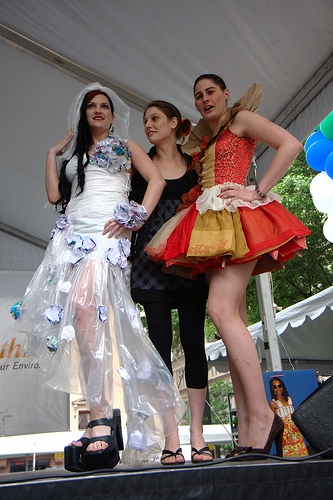 Participants in the EPA Earthfest Recycled Fashion Show in Dallas, TX. Photo by steevithak, Flickr. On April 6, Cedar Rapids/Linn County Solid Waste Agency and Goodwill of the Heartland will host the fifth annual Recycling in Style Fashion Show. The fashion show features used clothing that has been turned into stylish outfits by clothing designers. The runway for the show also supports sustainability. It was made from broken pallets at Goodwill’s Cedar Rapids facility.